*** This item is currently on a pre-order basis. Shipping for all orders on this item will start on November 11, 2018. Material is fine. But the item is not for my dog - English bulldog. Very dificult to get dressed and more dificult strip off. It is better to be no whole and turn on the stomach. Excellent Quality, Delivery on time. Will order more from this store. Excellent sweatshirt, dog happy! Delivery week 2, recommend! 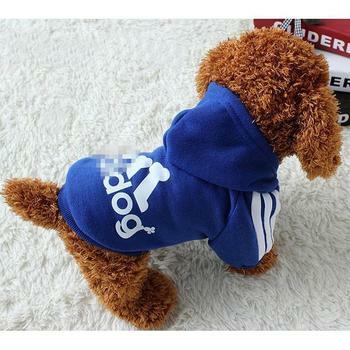 Fast delivery, quality is very good, the jack Russell village is perfect. Perfect for our girlThank you for fast delivery and so cute hoodie!Recomend!!! Super soft, extra fast delivery. Looks super coll. Very satisfied!!! Hoody-Super! Super quality! Soft, good-quality, cool! Our daughter like! Good store! Quickly received! Happy! Thank you very much! Exactly as pictured, has little hair by inside and appears very warm. We Have pup of Bull terrier and has left a big little But when she grows up will be perfect.